Camping with the family and your pets can be a great holiday. However, without taking precautions and planning ahead it can be a disastrous vacation. Sleeping under canvas can be exciting and cosy for the family. Today’s modern tents mean that the holiday can still have all mod cons. However the family pet may be spooked by flapping canvas, the sound of the wind at night and the change to his routine and sleeping place. 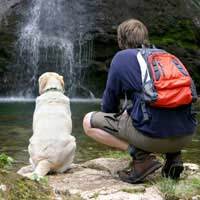 If you think that your pet would not enjoy the whole camping experience then leave him at home with friends or book him into a kennel, cattery or other pet hotel for the duration of your vacation. It is not enough to just zip up the door of the tent and retire to bed expecting your pet to settle on a blanket. A sudden noise or just an inquisitive nature could mean that your pet can wander off in the night and get lost. By taking a collapsible cage with you your pet will have a cosy place to sleep at night and to settle in during the daytime. Never leave your pet in his cage and go out for the day. Not only will the animal be distressed but he could get overheated or make a noise that upsets other holiday makers. Remember to take your pet’s supply of food with you as you may not be staying near a pet store or shop that stocks your favourite brands. If you use a complete food weight up a day’s ration in a plastic bag ready to tip into his bowl. This will save space as you will not have to carry a larger bag of food with you and save time in preparation during the holiday. Just as you will have unbreakable plastic camping equipment so will your pet as there are plastic food bowls and water bowls available for pets. A cheap, an reliable item is the non spill travel bowl that has a lip around the rim of the bowl that stops water being spilt, this is easily available in pet stores and is a boon for the pet that travels. Just as you pack your own bag for a holiday remember to pack a bag for your dog. A small holdall with his bowls, blanket, towel, brush and food packed in it means that all his equipment is stored in one place. If your pet is on medication this can be stored in his bag along with his other possessions. There will normally be a small cost for pets to stay on a camp site. Always check that pets are welcome as there are some campsites that are not keen on pets as visitors. Be considerate of other holidaymakers who may not be as keen on pets as your own family. Do not let your pet stray as not only is he open to being attacked by other pets but could get lost or stolen. For larger pets there is a metal screw that can be screwed into the ground and has a loop for the lead to be attached to for safety. Be prepared for injury or illness with your pet. Just as you would carry a first aid kit for the family you can also have a kit for your pet. These can be purchased from pet stores and are ideal solutions for small injuries or for use whilst waiting for a vet. When booking your campsite ask the campsite manager for the contract details of a local vet. This will save time in the likelihood of an emergency. Although the hot sunny weather is ideal when camping, the sun is not always good or our pets. Keep them in a shady cool area with water to drink. Never leave your pet in a car as it can quickly turn into an oven and kill them. Add an extras tag to your pet’s collar during the holiday in case he is lost. Perhaps the words ‘I am on my holiday’ and a mobile phone number would be a good idea as he would then be returned to you faster. Camping with the family pet can be a pleasurable experience if a little thought and planning is made in advance.